Drilling technology has advanced immensely in the past 20 years. Directional drilling, rotary steerable drilling and other smart downhole techniques and tools have progressed past the typical vertical and horizontal well, allowing drilling engineers to design wells of complex geometry and extract energy resources from remote, untapped places. While technology continues to excel, there is a growing need for multidisciplinary information to assist in the design and planning of complex wells. To answer this need, Robello Samuel, with the help of Xiushan Liu, releases a necessary reference titled Advanced Drilling Engineering. 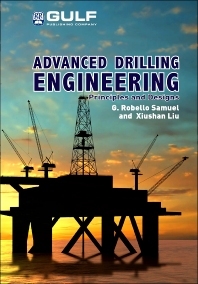 Samuel and Liu’s volume covers full understanding of elaborate drilling processes and engineering well design aspects. Starting with well trajectory and wellbore positioning, they explain well-path planning for directional and extended-reach wells. Other vital topics include collision avoidance, checking for proximity between neighboring wells, downhole survey tools plus MWD/LWD and through bit logging, and intelligent smart well technology, including downhole monitoring tools.